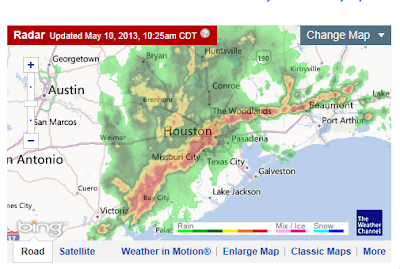 At Home with the Hinkleys: Does anyone have an Ark I can borrow? It is raining something fierce over here today! Here is a photo of the only area of natural light in my office - that little black square in the center of the picture, diagonal from the clock on the wall. It looks like night outside. Pic fail, you can not tell, but it is raining super hard. This area floods at a drop of a hat too, so hopefully this gigantic rain cloud moves on down the road here soon. This rain is just making me super sleepy though. We have been having this rain here lately too! We need it so bad though, so I am trying not to complain. Hope it goes away soon for you guys though! Lots of rain and storms here in Austin! It makes me sleepy! We've had crazy rain here in Northwest Arkansas too... Half the roads were flooded this morning on my way to work... Too bad that wasn't an acceptable excuse to call in. :( Rain makes me very sleeeeeepy too! Yikes. Stay warm and dry, lady!! Yesterday was the first day in over 7 days that we did not have any rain. It's been nice to see the sun again!